After years of claiming an outdoor model was "coming", addressing their biggest user demand, Nest has finally released their Outdoor Camera, an IP67 1080p model, along with improvements to their Nest Aware analytic platform, aptly named Person Alerts, claiming to alert on people and reduce false alerts. We bought and tested the new outdoor model to see how it performed and whether it lived up to these claims. Inside, we test against the indoor Nest Cam model and a low cost Hikvision bullet to see how the Outdoor Cam stacks up. In our testing, the Nest Outdoor Cam is effectively an indoor Nest Cam in a weatherproof housing, offering no improvements in low light image quality or IR range. Additionally, its housing and cable/connector design make it easy to vandalize or defeat, while reducing installation flexibility compared to many consumer cloud models. Nest Aware with person alerts offer some of the most accurate video motion detection of consumer/DIY cloud cameras we have tested, and better than many commercial cameras. Sightline offer a much improved timeline compared to Nest's past mobile app, and better than most consumer offerings, where playback/search are notoriously limited. This is a bullish sign for video analytics that Nest has been able to develop highly accurate video analytics, something that has been beyond the capability of many professional video surveillance manufacturers who have tried to do this for years. While the form factor / construction of this camera will limit professional adoption, this does indicate that Nest has the potential to take this up market into the commercial space where accurate analytics are even more valued. Compared to Hikvision's low cost Value/Value Plus cameras and/or Ezviz, the Nest Cam Outdoor is limited by shorter IR range/poorer nighttime image quality, is more expensive than many models, and does not include SD card recording, requiring a minimum investment of $10/month. Additionally, Hikvision offers several indoor and outdoor models compatible with the Ezviz (under both brand names) with varying lens options, giving users more flexibility in camera selection. However, Nest Aware with person alerts offers a clear advantage in motion/analytic accuracy, with few false alerts, a common problem with Hikvision VMD and analytics. Users looking for a minimum of false alerts may be willing to spend more on Nest cameras and Nest Aware. The Nest Cam Outdoor sells for $200 online, the same price as the existing indoor Nest Cam. These prices are similar to other cloud storage plans. Nest also has a free plan which includes only three hours of video storage, and does not include Nest Aware, person alerts, or clip generation. In the video below we review key features of the Nest Cam Outdoor, reviewing specific issues in more detail below. Because of its magnetic mount, the Nest Cam Outdoor may be easily knocked down or moved, making it easy to disable for a vandal with a stick, broom, or well placed snowball or tennis ball. Even light force on the camera's USB cable causes it to rotate on the mount. Further, relatively light impact (a light slap) can knock the camera off the mount completely. Because the Nest Cam Outdoor uses a proprietary locking weather resistant USB connector to connect the camera to the power/wireless box, it cannot be simply extended using longer USB cables or extenders as the Nest Cam Indoor and other consumer cameras can. Users must place the camera within 25' of an outlet. Nest recommends that users without an available outlet use light bulb adapters to power it from a landscape or flood light or call a pro installer to add an outlet. Additionally, since it cannot be shortened, users installing the Outdoor cam near an outlet must coil up and secure/hide excess cable. The Nest Cam Outdoor's cable is exposed, connected through the bottom of the camera, unlike typical outdoor bullet and dome cameras which route cable through the housing/mount. This means that even if users drill through a wall to mount the camera, the cable is still exposed to vandalism and may be cut or grabbed and used to pull down/move the camera. The camera experienced ~3 false alerts over two nights of testing, caused in all cases by cars approaching, causing light changes in the majority of the foreground in the scene. Note that these were shown only as "activity", not people. Sightline shows snapshots from events Nest Aware believe overlaid directly on the timeline so users may quickly review activity (available in mobile apps online). Users may tap on an event to load video and through video by swiping up/down at variable speed. We found Sightline simple to use in our tests, and quick to review large segments of video. However, scrubbing is coarse, making slow playback of video difficult. 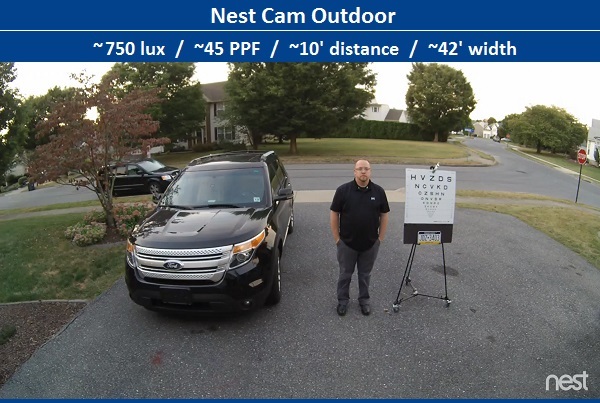 We shot the Outdoor cam against the original Nest Cam as well as a Hikvision IR dome with similar FOV to see how they compare, using a typical residential scene, viewing a two car driveway. 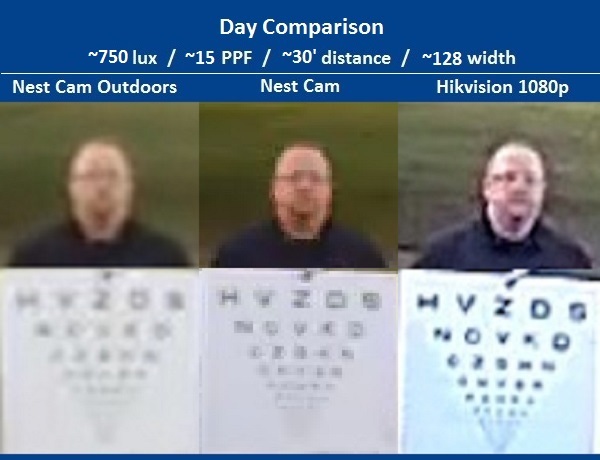 In a well lit daytime scene at ~45 PPF/~10' distance, the Nest Cams look very similar, with the Hikvision model providing slightly better text legibility. 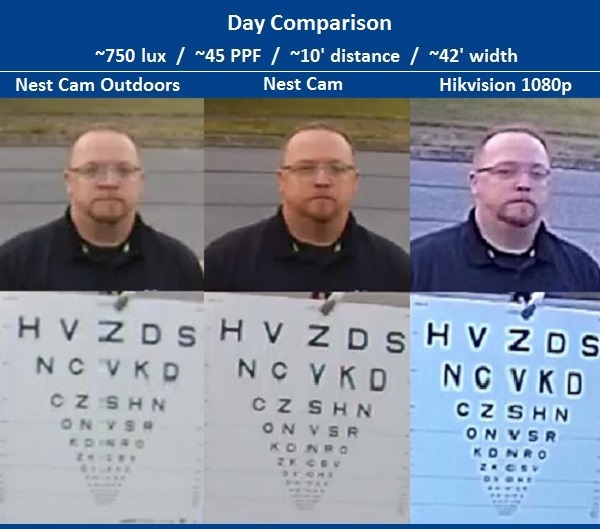 At ~15 PPF/~30' distance, none of the cameras provide details of the subject's face, but text is more clear and evenly exposed in the Hikvision 1080p model. 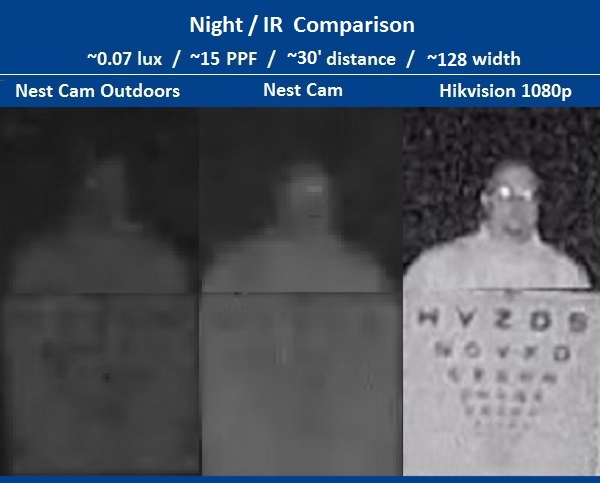 At night, with IR on, details are again similar in Nest Cams, but Hikvision overexposes the subject almost completely. Finally, at longer range, the subject is visible in both Nest Cams, though without details of the subject or chart. 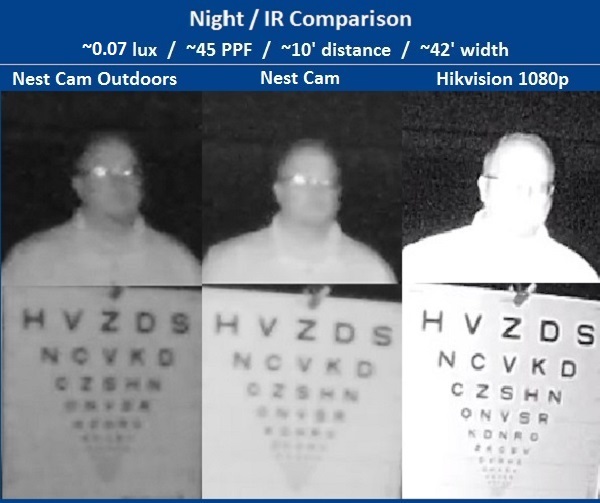 The Hikvision camera provides better images of our subject due to its stronger IR.